I’ve yet to meet a person who doesnt love a good deal. Amazon’s Prime Days Deals 2016 aims to not dissappoint. Because my family consists of a bunch or guys and me, the lone female, I picked my favorite deals from a decidedly guy perspective. 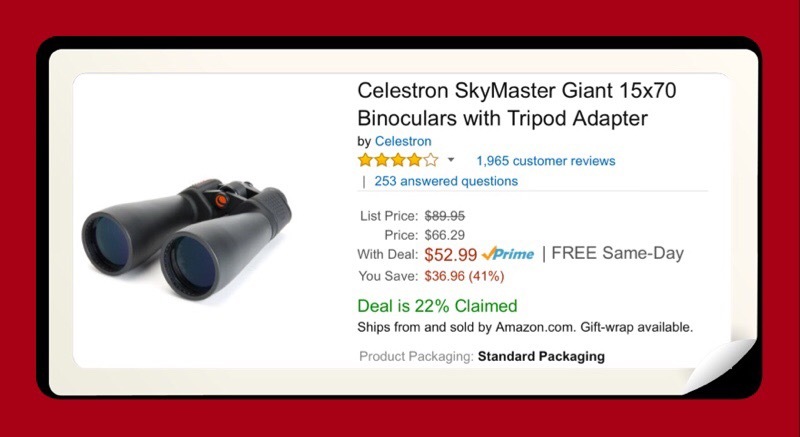 These binoculars which really function as more of a telescope were one of the coolest tech gadgets I found and I would have puchased them had Amazon’s shopping cart functioned properly. This link will take you to Amazon’s main webpage which is the springboard for all of their Prime Day Deals…including their Device Deals, their Spotlight Deals and alongside the left hand side of the page, all Prime Day Deals. One additional savings feature is for those Prime members who already own Amazon’s Echo device. If you’ve taken the steps necessary to enable Alexa to buy things from Amazon’s website for you by using voice commands via Alexa, the Personal Assistant, you’ll receive an additional $10 off of your 1st item over $20. I just ordered the Fire TV using Alexa because I’ve been wishing for it a long time! So rather than spending $99…Fire TV will cost me just $59.99! Exciting stuff right? So,if your looking for some super deals on Amazon, today (July 12th) is the day to shop for them! Amazon Prime Day is officially done! How Did Amazon Fare in Their 2nd Prime Day Annual Event? Very well according to CNET…read the details of the article shown below. This entry was posted in Amazon, Amazon Prime, Things I Love and tagged Amazon, Amazon Prime, Amazon Prime Day Deals. Bookmark the permalink.